Jumping rope between resistance training sets is one way to punch up your workout. For busy women, getting in shape using conventional methods can be a time-consuming drawn out process that takes weeks or even months. If you don't have time for that -- and want to whip your body into incredible shape fast -- you need to amp up your intensity. But before you plunge into a high-intensity workout program, make sure you are fit enough to go the distance. If you were to follow the current guidelines for fitness and weight loss recommended by the American College of Sports Medicine, you would need to devote 150 to 250 minutes per week or more to moderate-intensity cardio, plus two to three resistance training sessions per week. Even with that kind of time commitment, your progress would be gradual. But if you turn up the intensity on your workouts, you can accomplish better results over a shorter length of time. To increase your treadmill intensity, ramp up the incline, increase your speed, or both. Try sprint intervals between lower intensity walking or jogging. 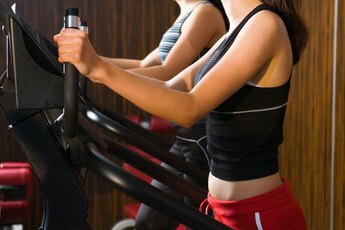 Do speed sprints on the elliptical for 30 seconds every two minutes, or increase the resistance level. Resistance training is a quick way to get firm, shapely muscles, improve your posture, increase your bone mineral density and boost your metabolism so that you burn more calories throughout the day. Women are often fearful of bulking up and looking too muscular. But according to the Women's Heart Foundation, your hormonal makeup of high estrogen and low testosterone make it difficult for you to get large muscles. Instead, you can expect tone, strength and endurance without the bulk. For fast results, do compound exercises, like squats and lunges for your lower body, incline dumbbell presses for your chest, shoulders and triceps, and seated cable rows for your back and biceps. Use weights that fatigue your muscles within eight to 12 repetitions. High Intensity Interval Training, or HIIT, provides a quick way to burn fat and whip yourself into shape with minimal time commitment. Interval training intersperses bouts of all-out effort between "rest" periods of moderate intensity. In a 2006 study of active young women published in the "Journal of Applied Physiology," just seven sessions of HIIT performed over a two-week period significantly increased the subjects' lean muscle and fat-burning capacity. Try interspersing intensity intervals between sets of body-weight exercises. For example, between sets of pushups, jump rope for 30 to 60 seconds at an all-out effort. Combine abdominal crunches with bench step-ups, or pull-ups with jumping jacks. Continue until you have performed exercises for all your major muscle groups, with intensity bursts between sets. Dancing is a fun and effective way to improve your fitness level, tone your muscles and decrease your body fat. Like interval training, dance moves alternate between high and low intensity, yielding optimal results. According to a study published in the "European Journal of Applied Physiology," female dancers have lower blood pressure, lower resting heart rate, lower body weight and lower body fat than sedentary women of the same age. To get your dancer's body, try classes like Zumba, Jazzercise, Hip-Hop, or other group exercise classes at your gym. Or enroll in ballet, tap or jazz at your local dance studio.